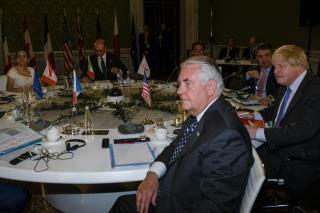 (Newser) – Secretary of State Rex Tillerson travels to Russia Tuesday—but, unlike when he visited Moscow as CEO of ExxonMobil, he will not be meeting Vladimir Putin. A Putin spokesman said Monday that they have not announced "any such meetings and right now there is no meeting with Tillerson in the president's diary," Reuters reports. John Kerry, Tillerson's predecessor, often met with Putin and the snub of Tillerson is believed to be the result of Russian anger over the US strike on a Syrian airbase last week. Boris looks like one of the 3 Stooges. Of course not. He isn't the president of US now is he?